The French Vermorel company (officially, Établissements V. Vermorel) traces its roots back to 1850, when it was founded as an engineering firm in Villefranche-sur-Saône, France. They built their first car in 1899, but series production didn’t being until 1908. Production took off until the outbreak of World War One and resumed immediately upon the war’s conclusion. The last Vermorel passenger car rolled off the line 1930 and heavy trucks were built through 1932. The company soldiered on in other arenas until 1965. This particular example was discovered in a barn in France in 1968. It had two owners until 1990 when the current owner bought it. It is likely powered by a 2.3-liter straight-four making 12/16 horsepower and the body is by Henri Gauthier & Cie. Vermorel is a rare marque these days and this is believed to be the only example in the U.K. It should sell for between $26,000-$39,000. Click here for more info and here for more from this sale. 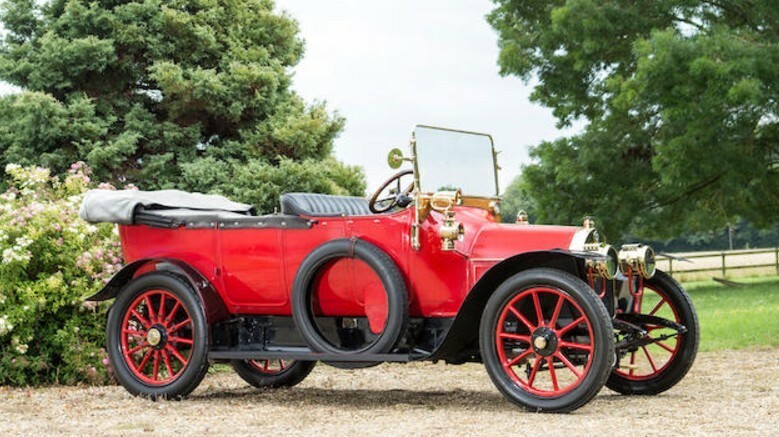 This entry was posted in Uncategorized and tagged 12/16hp, 1913, auctions, Bonhams, cars, classic cars, model l, torpedo, tourer, vermorel by classiccarweekly. Bookmark the permalink.